SM52. Our NEW 52 LED Scorpion Master Blacklight Flashlight"
Our newest product. Low priced for a Very Effective light. Batteries not included. With unbreakable SUPER BRIGHT UV LED bulbs. Hunt down scorpions with your Scorpion Master 52. Exposure to ultra-violet light will cause scorpions to fluoresce and make them easier to spot, even in the darkest of night. Other uses include: Counterfeit money detection, lighting up fluorescent materials, charging glow in the dark items, urine detection (faint), ID checking (some ID's), UV curing, invisible ink detection, etc. Works well with Blue Invisible Ink. Uses four 1.5V AAA Batteries. Run Time approximately 10 Hours on 4 AAA Batteries. Color Purple with Black Grip. Safety Warning: Never look directly into the UV LEDs. High intensity ultra-violet light can cause eye damage similar to sunlight with direct exposure. UV blocking goggles or spectacles are recommend if light will be used around the eyes. This is not a TOY and must be kept away from children. Price: only $ 29.99 each. SM100. NEW "The Scorpinator" our Scorpion Master 100 LED Ultra Violet Scorpion Blacklight Flashlight"
Our professional product "The Scorpinator". THIS IS MY PERSONAL FAVORITE. Batteries not included, you will be ready to go. If you are traveling to find scorpions, the gas will probably cost more than this, the best professional scorpion tool you could take with you. "The SCORPINATOR" finds the scorpions further out than my eyes can see. 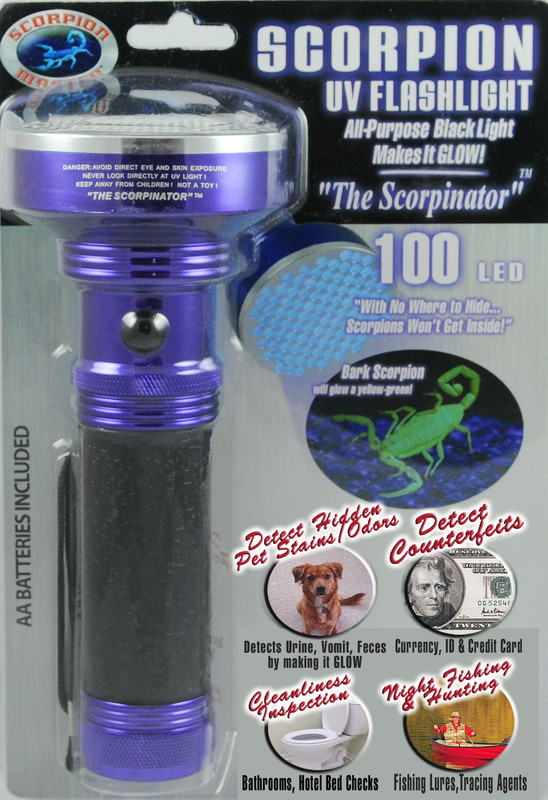 "The Scorpinator" Scorpion Master SM100 Ultra Violet 100 LED Scorpion Blacklight Flashlight features water-resistant high-strength aluminum case with toggle on-off switch for continuous or hands free use. Fluoresces at distances over 30 feet in darkness with unbreakable SUPER BRIGHT UV LED bulbs. Hunt down scorpions with the Scorpinator Scorpion Master 100. Exposure to ultra-violet light will cause scorpions to fluoresce and make them easier to spot, even in the darkest of night. Other uses include: Counterfeit money detection, lighting up fluorescent materials, charging glow in the dark items, urine detection (faint), ID checking (some ID's), UV curing, invisible ink detection, etc. Works well with Blue Invisible Ink. Uses four 1.5V AA Batteries. Run Time approximately 10 Hours on 4 AA Batteries. Color Purple with Black Grip. Safety Warning: Never look directly into the UV LEDs. High intensity ultra-violet light can cause eye damage similar to sunlight with direct exposure. UV blocking goggles or spectacles are recommend if light will be used around the eyes. This is not a TOY and must be kept away from children. Price: only $ 49.99 each. SM28. 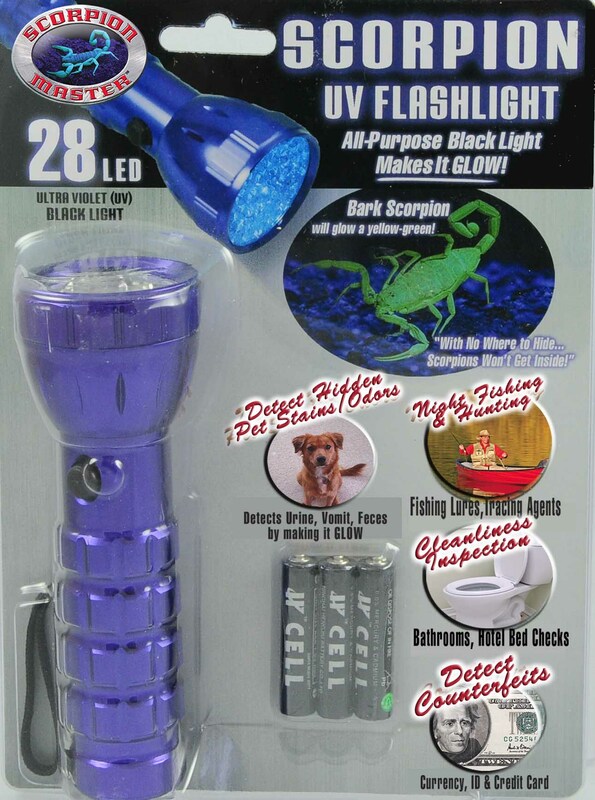 Scorpion Master 28 LED Ultra Violet Scorpion Blacklight Flashlight. Perfect for home use. Batteries not included, you will be ready to go. Pocket sized and effective. Scorpion Master SM28 Ultra Violet 28 LED Scorpion Blacklight Flashlight features water-resistant high-strength aluminum case with toggle on-off switch for continuous or hands free use. Fluoresces at distances over 20 feet in darkness with unbreakable SUPER BRIGHT UV LED bulbs. Hunt down scorpions with the Scorpion Master 28. Exposure to ultra-violet light will cause scorpions to fluoresce and make them easier to spot, even in the darkest of night. Other uses include: Counterfeit money detection, lighting up fluorescent materials, charging glow in the dark items, urine detection (faint), ID checking (some ID's), UV curing, invisible ink detection, etc. Works well with Blue Invisible Ink. Uses three 1.5V AAA Batteries (included) Run Time approximately 10 Hours on 3 AAA Batteries Color Purple with Black Grip. Safety Warning: Never look directly into the UV LEDs. High intensity ultra-violet light can cause eye damage similar to sunlight with direct exposure. UV blocking goggles or spectacles are recommend if light will be used around the eyes. This is not a TOY and must be kept away from children. Price: only $ 19.99 each. SM09. 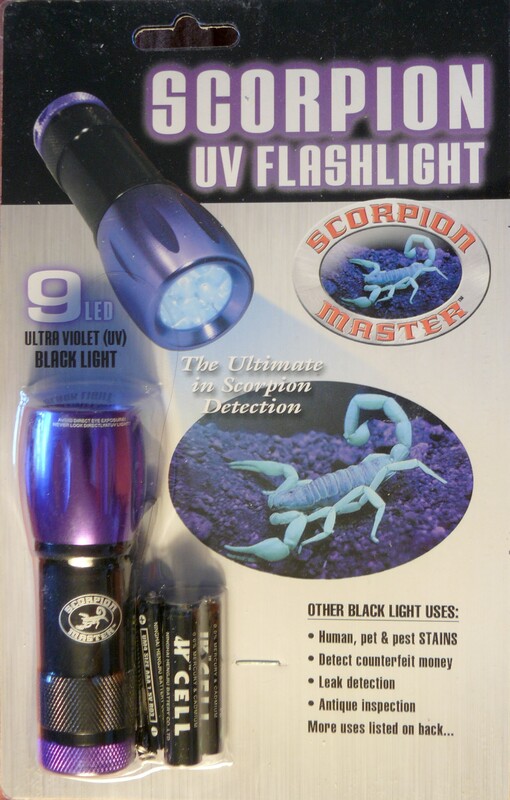 Scorpion Master 09 LED Ultra Violet Scorpion Blacklight Flashlight. OUR ECONOMY MODEL. Perfect for home use. Batteries included, you will be ready to go. Small, pocket sized and effective, I keep one handy in my truck. Scorpion Master SM09 Ultra Violet 09 LED Scorpion Class Blacklight Flashlight features water-resistant high-strength aluminum case with toggle on-off switch for continuous or hands free use. Fluoresces at distances over 20 feet in darkness with unbreakable SUPER BRIGHT UV LED bulbs. Hunt down scorpions with the Scorpion Master 09. Exposure to ultra-violet light will cause scorpions to fluoresce and make them easier to spot, even in the darkest of night. Other uses include: Counterfeit money detection, lighting up fluorescent materials, charging glow in the dark items, urine detection (faint), ID checking (some ID's), UV curing, invisible ink detection, etc. Works well with Blue Invisible Ink. Uses three 1.5V AAA Batteries (included) Run Time approximately 15 Hours on 3 AAA Batteries Color Purple with Black Grip. Product Size 4" (length) x 1-1/8" (diameter). Safety Warning: Never look directly into the UV LEDs. High intensity ultra-violet light can cause eye damage similar to sunlight with direct exposure. UV blocking goggles or spectacles are recommend if light will be used around the eyes. This is not a TOY and must be kept away from children. Fast US Mail Shipping and handling $9.99 in the USA. Arizona residents add 9.0% sales tax to order. For Non Paypal orders or Non USA orders, please email me. This Flagstaff Arizona Scorpion site copyright Rich Ayrey 2009 - 2017. This Arizona Scorpion page created 02/16/09. This Arizona Scorpion page last updated 08/07/2018.